Well, the painters are almost done. 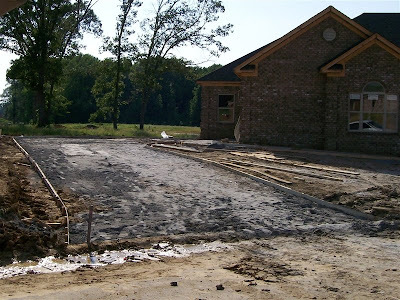 out the driveway and will pour the concrete tomorrow! and make sure it is how we want it. and the beautiful cabinets. So, here you go. Here is a shot of the driveway and sidewalk. the side of the house to park two cars. And here are the cubbies. 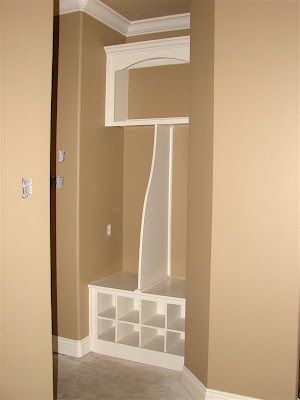 to put in there for coats, backpacks, etc. 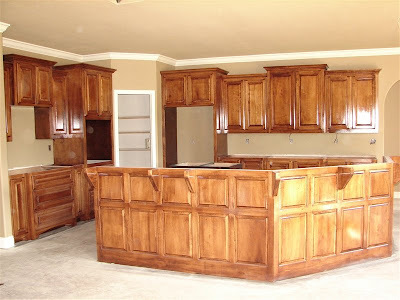 And here are the kitchen cabinets. Even though they are a bit dusty, I LOVE THEM! 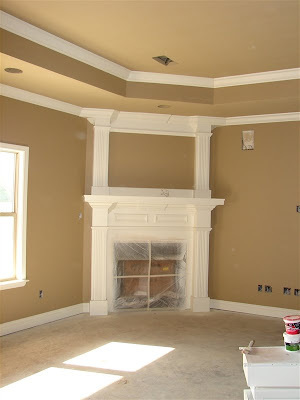 And here is a shot of the fireplace and mantle. 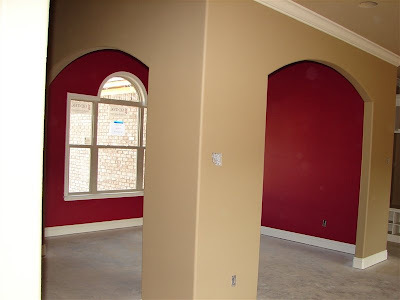 I love how the paint color turned out on the walls. Perfect! Now take a look at this dining room. I love how the red turned out. but they aren't totally done yet. 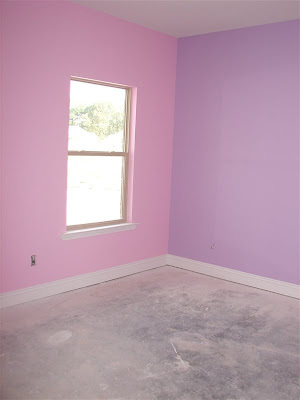 Rachel loves her pink and purple room. Again, the colors turned out great. The green didn't turn out quite like I wanted. shines through the windows, it looks mostly yellow. windows and her quilt on her bed, it will look much better. We'll see. Rebekah even says it is pink and yellow! wasn't quite what it was supposed to be. It had too much gold in it. She likes it, so it's staying. 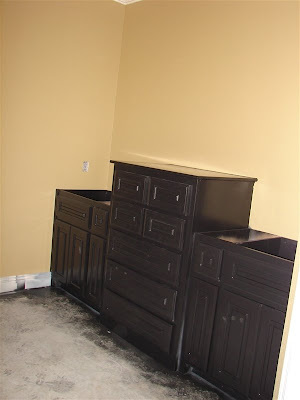 Here is a shot of the black cabinets in our master bathroom. I can't wait to see it with the mirrors, counter tops, etc. was where we found the mistake. 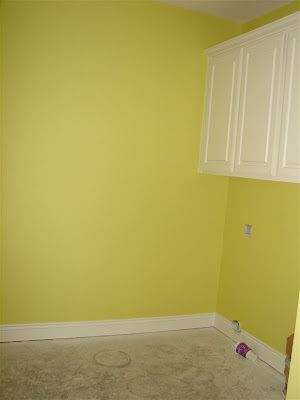 They painted our bedroom the wrong color. it was the paint that had too much gold in it. 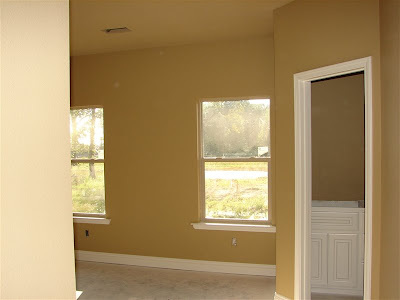 It was supposed to be the same color as the family room. repainted to match the family room. when we had NINE paint colors to start with! And here is the green again. This time it is in the laundry room. any sunlight in here so it looks more green than yellow. Lots of color and looking better and better. out of the apartment and into the house! with a target closing date of July 14th. Let's pray we stay on schedule! By the way, we love our builder. really enjoyed getting to know him and his wife. very helpful with our many questions. I have to say, this whole process has been great. you hear about building a house. let me know and I'll give you Builder Bruce's information. Wow, it is all so gorgeous! you're kitchen is super nice! I can tell from your writing how excited you are about your new house, that's awesome! I really like all the colors too. What? Not "Bruce the Builder?" tee hee! Your house is Gorgeous with a capital G!!! Did you look at ikea (www.ikea.com) for hooks for the cubbies? We thought the same thing when we built our house (not the horror story people told us about). We loved it and hope to do it again. Based on what our house looked like a couple weeks before we moved in, I'd say you should definitely be in by July 14 :) I think ours looked like that less than 2 weeks from moving in.